OK – so maybe the Elio does not work for you… $6,800 for a three wheeled motor/car is a bit much. What if I told you, Organic Transit offers something really similar, but for the low, low price of $5,995 that also holds two passengers! That’s right, you can replace that gas motor with some pedals and an electric motor, a solar panel on the roof and a top speed of 20 MPH and you can pocket almost a $1,000 savings! Did I mention this bike has three speeds! Best of all, you they are in production! Just click the buy button and you can have your very own really wide tricycle that will get stuck in traffic like everyone else. I give them kudos for effort, but this thing is another solution looking to solve a problem, and is a bit off the mark. This entry was posted in Not quite a bicycle, Not quite a car on February 9, 2015 by Gary. I agree that it seems pricey but otherwise this thing doesn’t bother me. Seems like a good way to do some shopping to get your kid to school (maybe, unclear if there’s a place for the kid to sit). 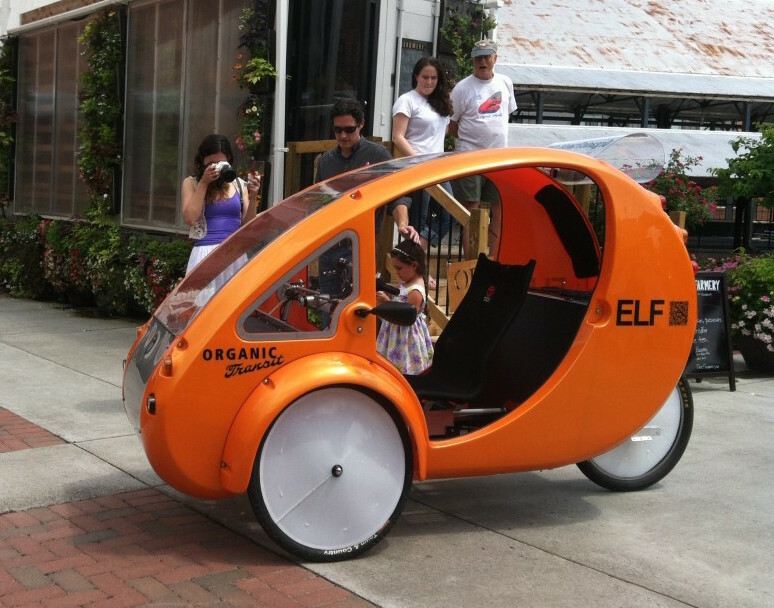 It might also work as a bike-to-the-train-station vehicle for a suburban couple that doesn’t want a second car. More importantly, this was WheeledThing post 100! Woo-hoo! Agreed – I like this thing, but the price is way out of line. I can pick a dozen decent bikes, or one Organic. I would love to see more of these things.